5:38 AM - 3.00 miles in 26:38 (8:53 pace). Just an easy 3 today. 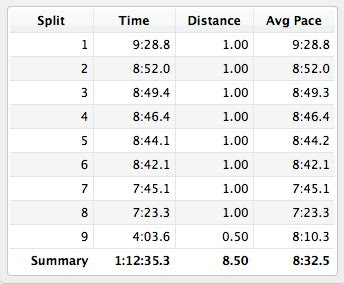 4:55 AM - 9.00 miles in 1:17:43 (8:38 pace). 5:30 PM - 4.00 boring miles on the treadmill. But Sons of Anarchy is getting better and better by the episode. 4:56 AM - 5.20 miles in 47:24 (9:07 pace). Its getting colder and colder these days. Still in shorts. Snow on the way. 4:37 AM - 20.60 miles in 3:08:33 (9:09 pace). Another split morning (like last week), starting with 11 miles in 1:37:51 (8:54 pace) in and around the neighborhood, followed by a quick drive to Rockefeller State Park for another 9.6 miles in 1:30:42 (9:27 pace), followed by volunteering at the Rocky's 5k. 7:03 AM - 9.00 miles at a slower than slow pace. Yesterdays winter storm brought deep snow, slush, and downed trees and branches. While it made for a difficult trek, the sights were spectacular. Running the Caminho Da Fé Part II is in the works for January 2013.....with a twist.